For the third year in a row, Policy Research Associates, Inc. has been recognized by the American Heart Association (AHA) in its annual Workplace Health Achievement Index. 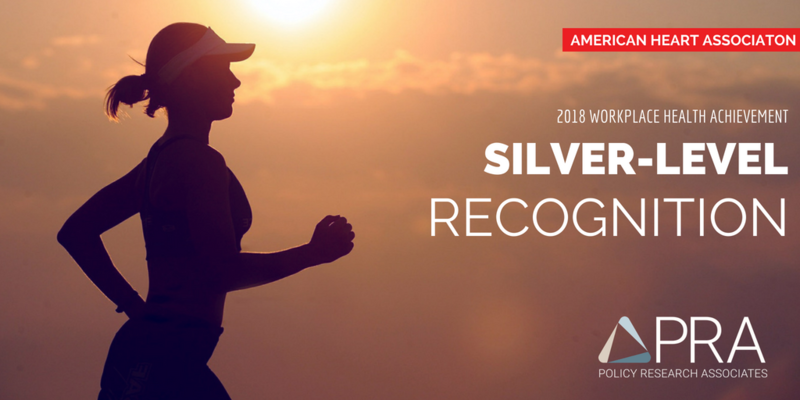 By embedding a culture of health and wellness in the office, PRA was able to surpass its previous bronze-level awards to achieve silver-level recognition this year! New in 2018, PRA began using the American Heart Association’s “My Life Check®” tool, a specialized, science-based online tool designed to help protect people from heart disease. Through its WellStaff Committee, PRA encourages healthy living by providing a number of options for our employees, including physical activity and wellness support, access to healthy foods, and a tobacco-free workplace. PRA provides two bikes that are available for employees to utilize during their Strategic Renewals and to run errands around town. The bikes are perfect for the Albany County Rail Trail, which runs right behind the office! During the month of May, Mental Health Awareness Month, we accomplished our goal to collectively reach 10 million steps from May 1 to May 31 to help raise awareness for mental health. Not only were we able to raise awareness during Mental Health Month, we had an opportunity to improve employees’ physical wellness with a total of 10,013,523 steps walked. An overall culture of fitness is evident at PRA. Employees are encouraged to use their daily strategic renewals for walking, biking, or other forms of physical activity. We also offer a Weight Loss Challenge in the office that allows employees to set goals and support each other in reaching them. PRA offers a Wellness Reimbursement benefit for employees, reimbursing 50 percent of wellness-related purchases up to $500 per year, with a maximum annual reimbursement of $250. Wellness-related expenses can include race fees, fitness classes, new sneakers, and more! Employees from all different program areas make up this wellness committee, which is responsible for organizing wellness programs in the office, maintaining the wellness page on PRA’s Intranet, and creating a wellness board. Bi-annually, PRA hosts an onsite First Aid/CPR/AED class for all employees who are interested in being certified. This class has a strong showing, with roughly 10 employees being certified (or recertified) each session. Each year, in October, PRA hosts a flu shot clinic for its employees to have easy access to the flu vaccine and get ready for the coming flu season. The clinic uses the insurance offered by PRA’s employee benefits and helps ensure that employees who are interested can receive that year’s vaccine. In addition to providing delicious fresh fruits and vegetables for employees to eat, the community garden next to our parking lot offers a great opportunity to get outdoors during the workday! This year we are growing herbs, peas, lettuce, kale, and more! Each week for the past 2 years, PRA has been a delivery site for Field Goods, a program that delivers local produce and healthy recipes to businesses along the Hudson River. Field Goods is a great way to expose yourself to new and healthy foods as well as support local farms. New for 2018, PRA took the pledge to Quit Big Tobacco. Policy Research works hard to maintain our culture of wellness in the office and is proud to be an awardee for the third year in a row. Thank you to the American Heart Association for recognizing us!